Mansfield Parkyns came from a family of many talents. In the days of Elizabeth 1, Richard Parkyns became Recorder of Nottingham and married the widow of the Lord of Bunny - thus starting the family connection with that village. Mansfield was born at Caen in Normandy on 16th February 1823 whilst his parents were on one of their visits to the Continent, the youngest son of Thomas Boultbee Parkyns (1797-1833). At the age of 10 he went to Uppingham School, which at that time had only 25 pupils and was the year in which Mansfield's father died. When his mother remarried he was sent to a tutor but soon transferred to Trinity College, Cambridge, where he only remained for a year. He was good at Latin and Maths and by the age of 19 was a fine shot, a talented artist, an informed ornithologist, a competent taxidermist and a formidable boxer. His mother died in 1838, when he would only be about 15. At the age of 19, and with no parental guidance, it would appear he considered himself a free agent and decided to join in the search for the source of the White Nile and if possible cross Africa from the Red Sea to the Atlantic. He told no-one in England of what he planned before he left. He went overland via Switzerland and Italy to Greece and the Levant to Constantinople. Whilst there he joined Richard Monckton Milnes and, with Alexandria in mind, Milnes went by sea whilst Parkyns decided to go overland via Smyrna [Izmir] where they joined up again, both continuing by sea to Alexandria. In Alexandria they embarked for Cairo and then sailed along the Nile, Mansfield making friends with all sorts of Arabs, trying to learn as much of the language as he could and achieving friendly relations with people in different stations in life. See map on right. The second part of his journey from Constantinople (Istanbul) to Smyrna, both in Turkey and then onwards to Cairo by sea. After the trip down the Nile they returned to Cairo and during the voyage on the Nile he had learnt a lot by reading about the countries he hoped to visit. He decided to set off for Abyssinia with a whippet and a Sudan servant named Said and now at the age of 20 decided to keep a journal for the family. He sailed down the Red Sea in a crowded dhow to Jiddah, mixing with the native passengers and going ashore at the various stops on the coast in order to sketch. From Cairo to Jeddah along the Red Sea and then to Abyssinia, map on left. The journey took 23 days and another 5 days sailing took him to Massawa the port for Abyssinia. Once ashore he indulged in shooting birds and gazelles for food and was often followed by about a dozen hungry people for the food he was about to shoot. He travelled barefoot and with no head covering. In the province of Tigre he learnt the local Tigrinya language and after a while turned north from his original route as he learnt the wildlife there was good. His way of finding lodging in a village was to sit under a tree until somebody asked him in. He loved living off the land and spent about eighteen months in the area collecting specimens, about 300 varieties of birds including vultures, but his main interest was just studying the flora and fauna. He went through a form of marriage with an Abyssinian lady, but his diaries at the time make no reference to her or the son named John who was born by her. His attitude to life is summed up in his own words "I thought the wisest plan I could adopt was to domesticate myself as much as possible with the natives, the better to study their habits and modes of life". Although he received no letters, papers, money etc. for ages he eventually received a letter stating that now he had come of age he had inherited the Manor of East Leake. 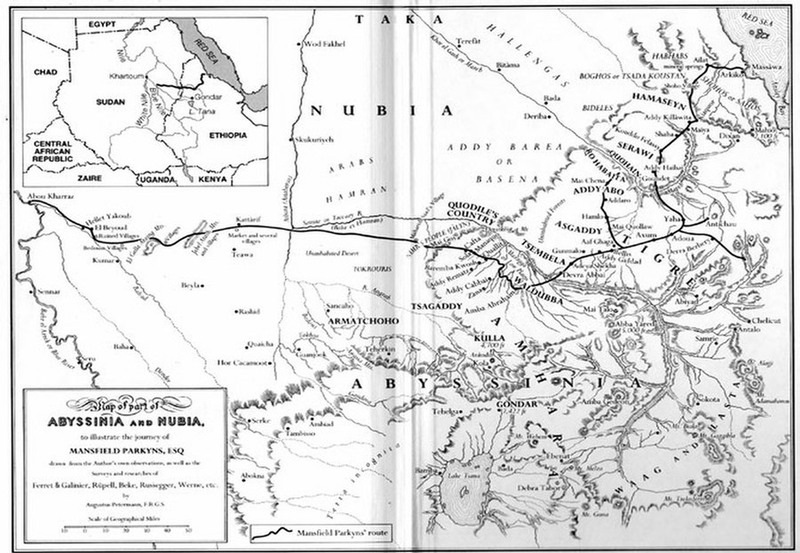 He returned to his original route and set off for Khartoum, the junction of the White and Blue Nile a journey of about 500 miles but with very many rivers to cross. When he reached Abu Kartaz (at the edge of the map) about 90 miles from Khartoum he, and by now quite a retinue, took a boat and as the river was in flood they covered the 90 miles in a couple of days. One of his servants was Gabré Mariam, mentioned again later. He was poorly treated in Khartoum until his Egyptian banker authorised an American trader to advance him a good sum of money so he acquired a good mud hut room of his own. Whilst in Khartoum he became severely ill, probably with cholera and during his convalescence collected information on the history of regions such as Nubia, Sennar and Kordofan. He left Khartoum for El Obeid in Kordofan in 1846, having spent three years in Abyssinia and now began to correspond again with family and friends in England. In Kordofan he lived with a tribe of camel-owning nomads for about two years. He intended to continue in a westerly direction but would have had to go through Darfur, however the Sultan there treated every white person as an Egyptian spy to be killed so eventually Mansfield decided to return to the UK. He had been 19 when he started his journey and was now 25. He travelled with his retinue and Gabré, his Abyssinian servant, the 600 miles to Cairo - probably some of the journey by boat. He arrived back in London in the summer of 1849 but parts of his valuable collection of birds, monkeys, etc. had been lost or eaten by rats in storage. He obtained a post as assistant secretary in the Constantinople Embassy, which lasted for less than a year due to incompatibility with the ambassador. Back at Ruddington at his brother's house, Gabré, his servant, continued in Mansfield Parkyns' service until he died some years later at Ruddington as tenant of Abyssinia Cottage opposite the church. In 1853 he published 'Life in Abyssinia' in two volumes illustrated by his own drawings and water colours - but it was panned by most of the critics. Mansfield Parkyns purchased Woodborough Hall in about 1852 and in January 1854 he married Emma Louisa Bethell. She was the third daughter of Sir Richard Bethell, Q.C., Solicitor General at the time and later to become Lord Chancellor with the title of Lord Westbury. Parkyns joined the local volunteers and was promoted from Captain to Lieutenant Colonel of the 8th Sherwood Foresters. Louisa gave birth to a son who died in infancy and then to eight daughters in rapid succession. The son to his Abyssinian wife was born shortly after Parkyns left the Sudan. Documents were made so that when he was 18 he could come to England but these were lost in a fire so he had no written evidence of his parentage. He married, was highly respected and died in about 1916. On her marriage Parkyns wife had received a substantial dowry, but with eight daughters and a wife to support he needed an income and through the influence of his father-in-law he acquired a post at the London Bankruptcy Court and was promoted to be Comptroller of the Bankruptcy Court for the next 20 years. Whilst working in London he lived at various times at Worthing and Petersfield, and had a town house or apartment in Bayswater Square where his daughters, in turn, would stay with him. As the family were living away from Woodborough Hall they are not recorded on the 1861/71 census, but from the 1881 and 1891 census and Buckland's Family Tree we know who they were and the approximate ages of all but the two eldest daughters, Elenor and Mary. The names and ages of the others in 1881 were Ada 22, Ethel 21, Sybil 20, Augusta 19, Hilda 18 and Dorothy 9 and they married mainly Army officers and clerics. In retirement he spent his time with the farm and garden and was a representative governor with Joseph Marriott of the village school and visited bed-ridden inhabitants, doling out hot soup and cough mixture to those he visited. He, with Richard Ward and, it is said, his daughter Sybil, carved the choir stalls, pulpit and screen in Woodborough Church, in memory of his wife who died in 1877. Mansfield Parkyns died shortly after their dedication on 12th January 1894, aged 70, and his grave is immediately to the east of St Swithun's Church porch. In the 1901 census his daughter Sybil is listed as head of the family with a son Mansfield aged 2, and her married sister Dorothy, living at 'Thorneywood' on Calverton Lane, Woodborough. Augusta unmarried aged 19, born Caen, Normandy, France. Hilda unmarried aged 18, born Paddington, London. Dorothy unmarried aged 9, born Bayswater, London. Memorial in Woodborough Church where Mansfield Parkyns designed the choir stalls: “To the glory of God in loving memory of Emma Louise Parkyns his dear wife who died 2nd September 1877 at 41. These choir stalls, the last work of his life, were designed, carved and given on Christmas Eve 1893 by Mansfield Parkyns of Woodborough Hall, who died 12th January 1894 aged 70”. East window dedication: Our Lord in memory of Mr and Mrs Mansfield Parkyns and daughter, Mrs Walker. Wright’s Directory of Nottinghamshire 1897. Records Misses Sybil, Augusta and Dorothy at Thorneywood Hall. Wright’s Directory of Nottinghamshire 1899. Records Miss Sybil at Thorneywood Hall. Thorneywood, which is located nearby to Woodborough Hall, this house believed to have been built by one or more of the sisters.